Last night we set the alarm on the tablet to 6am as we knew we were going to have a long day and that the temperature was going to climb today. So the alarm goes off a 6am and I tell you it is pitch black outside. Fortunately the bbq area has a table and light so we had our brekky there. It didn't really become light until well after 7am. it is great riding country and as you can see it is 'big sky is is country'. We haven't ridden this road before. From Banyena we turned south for 8km (a tailwind too!) to the Wimmera highway and from there we were going west to Rupanyup which is a further 15km on. The highway to our surprise was quiet - the odd B-double now and then. By now the wind is blowing across our right and has picked up in intensity but it is ridable. This is our biggest riding day yet and poor Kouta is beginning to feel it as when we stop for a break he doesn't really want to get out of the trailer! as you can see the sun shade he has on the trailer works a treat especially as we are going west. We get to Rupanyup just before 1pm so we made good time. We have stayed here before and the memorial park has a few overnighters here - 2 vans at the moment, us and another who I think will be sleeping in their swag. The only difference to last time is that we now have to pay for our showers which is okay at $1 for a 5 min hot shower. There is plenty of shade here and a covered bbq and tables. There are power points for the vans on the gravel so we are near the bbq using that one. When we got here there was a group of older ladies that were part of a group run by some local health group that take them out on weekly shopping and outings. Most were from here in Rupanyup, Minyip or Murtoa. They asked us to come over and chat to them about what we are doing. Neil relishes this sort of thing and marched right over and chatted merrily to them and they loved him ... you couldn't stop Neil at all! Me I just stood to the side and every now and then I got a word in! 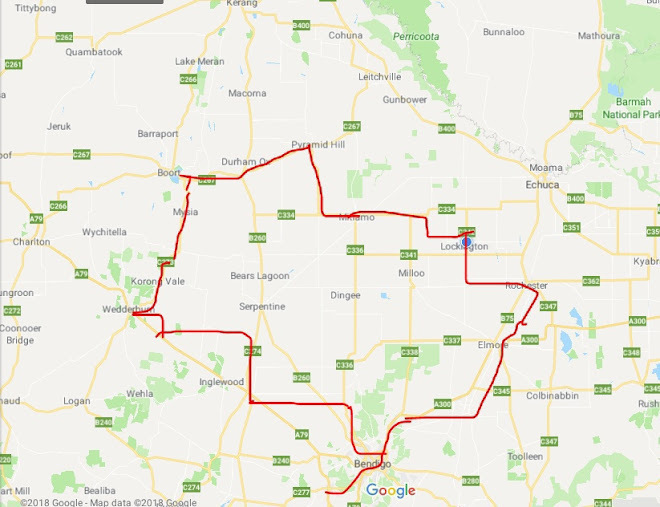 Tomorrow we keep going west to Murtoa - to see the stick shed but I don't think we can go in but we can see it from the highway and then we swing north east to Minyip - the reason for the roundabout way is so we can pick up some food in Murtoa - don't think Minyip has much!